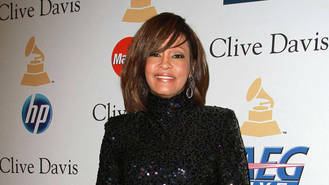 Whitney Houston will not be resurrected in hologram form anytime soon. Christina Aguilera recorded a duet with an eerie image of the deceased star on the season finale of U.S. talent show The Voice next week (beg23May16), but plans for the cutting-edge performance have been scrapped after it leaked online on Thursday (19May16). Pat Houston, the executor of Whitney's estate, tells ET Online the hologram in its present form is simply too low-tech for the family to allow it appear on a primetime broadcast. "We are so appreciative of the opportunity for the Whitney Houston hologram to appear on NBC's The Voice with a talent pairing as extraordinary as Christina Aguilera and Whitney Houston," Pat wrote in a statement issued on Thursday (19May16). "We were looking to deliver a groundbreaking duet performance for the fans of both artists. "Holograms are new technology that take time to perfect, and we believe with artists of this iconic caliber, it must be perfect. Whitney’s legacy and her devoted fans deserve perfection." She emphasised the decision to scrap the TV duet was purely based on the technology and had nothing to do with Aguilera, noting, "After closely viewing the performance, we decided the hologram was not ready to air. We have much respect and appreciation for Christina, and she was absolutely flawless." Whitney's estate executors sealed a deal with Greek billionaire Alki David, the CEO of Hologram USA and FilmOn, last year (15) to create a three-dimensional laser image of the Grammy-winner. The Whitney hologram was set to appear as part of a worldwide tribute tour after premiering on The Voice. It is not clear if those plans have been scrapped in light of the technology flop. The live two-part season finale of The Voice airs in America on 23 and 24 May (16). Happy Mondays singer Shaun Ryder has a "painful" hernia. Reggie 'N' Bollie are "looking forward" to recording a song with Cheryl. Singer Kesha will perform at the Billboard Music Awards after all. Snow Patrol's Gary Lightbody and Johnny McDaid are working on new music with Ed Sheeran. Miley Cyrus enjoyed dinner with rumoured fiance Liam Hemsworth's family in Malibu amid reports the couple are wedding planning. Drake has become the world’s most-streamed artist on Spotify after Views was made available on the service. Lionel Richie will receive the Nordoff Robbins O2 Silver Clef Award. Britney Spears is hot on the heels of social media queen Kim Kardashian as she launches her own mobile app. Willow Smith has teamed up with 'Superbad' actor Michael Cera for her new single.